Introduction: Temperomandibular joint (TMJ) is subjected to many disorders commonly called Temperomandibular disorders (TMDs); such as TMJ hypermobility, ankylosis, internal derangement, degenerative joint disease. Internal derangement is characterized by abnormal relationship of articular disc to the condyle and disc to fossa. In past many non-invasive conservative treatment modalities were tried out for its treatment which are joint unloading, use of anti-inflammatory agents, physiotherapy etc. Now a days corticosteroids and platelet rich plasma (PRP) has been proposed as an alternative therapeutic agent. We aimed to assess whether intra articular injection of PRP in TMJ minimises the symptoms of internal derangements as compared to injection of hydrocortisone with local anaesthetic. Materials and Methods: Twenty patients for a total of 32 joints with reducible anterior disc location were divided in two groups. One group received PRP injection and the other received hydrocortisone with local anaesthetic for arthroscopy in their affected joints. Both patients and operator were blinded to the contents of injections. The patients were assessed for pain, maximum inter-incisal mouth opening and TMJ sound. 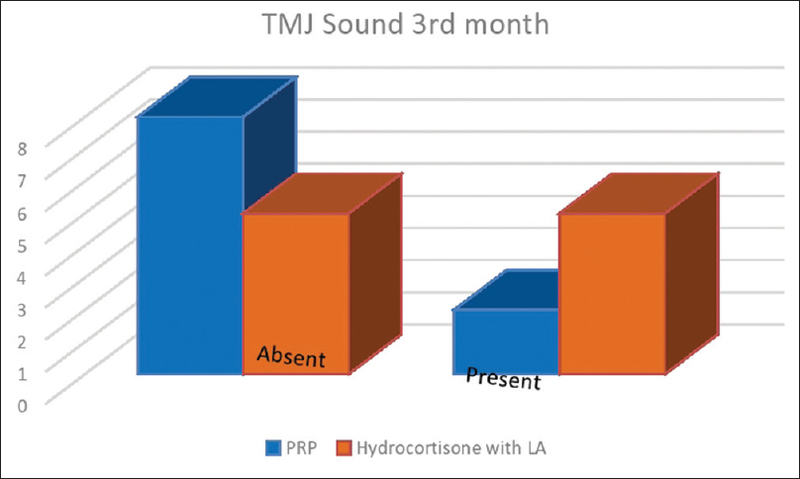 Results: In the group of PRP injection, pain was markedly reduced than the group of hydrocortisone with local anesthetic; mouth opening was increased similarly in both groups and TMJ sound was experienced lesser in patients who received PRP. Conclusion: Injections of PRP were more effective in reducing the symptoms, as compared to hydrocortisone with local anaesthetics. Temporomandibular joint disorders (TMD) affect the jaw joints and related structures. This includes painful myofascial problems, internal derangements, and certain degenerative and rheumatolgic problems that result in pain, joint noise, and limited mouth opening. Primary goals of the treatment for TMD are to increase the range of motion and relieve the functional pain of the temporomandibular joint (TMJ). Corticosteroids has anti-inflammatory properties and it exerts by inhibiting the prostaglandins synthesis which is an important mediator of inflammation, whereas platelet-rich plasma (PRP) is a concentrate of platelets and associated growth factors and has a potential healing properties through the recruitment, proliferation, and differentiation of cells, and tissue remodelling.,, Thus, we embarked on this double-blind randomized study to assess the efficacy of PRP injections compared to hydrocortisone with local anesthetic in the conservative management of anterior disc displacement with reduction. Twenty patients for a total of 32 joints with reducible anterior disc dislocation, as confirmed by magnetic resonance imaging, were divided into two groups (Group A and Group B). PRP was used for Group A (18 joints of 10 patients), and hydrocortisone with local anesthetic was used for Group B (14 joints of 10 patients). Both patient and operator were blinded to the contents of injections used in arthroscopy. Patients were assessed pre- and post-operatively at the intervals of 1st week and 3rd month for pain and maximal inter-incisal opening (MIO). TMJ sound was assessed after 3 months. Patients with history and clinical presentation of disc displacement with reduction, clicking, and pain on jaw movements. Patients with an inflammatory or connective tissue disease, neurologic disorder, severe anemia, thrombocytopenia, or malignant disease in the head and neck region. First, 5 ml blood is withdrawn from the patient. Then, blood is poured in a test-tube in which sodium citrate anticoagulant (0.5 ml) is already present. It is centrifuged at the rate of 2100 rpm for 15 min. Then, the plasma of the first harvest was fractionated using centrifugation at 3500 rpm for 10 min to collect the pellet. For each TMJ, 0.6 ml PRP was drawn into 2 ml syringes. The temporomandibular region was prepared with antiseptic solution. The injection point was marked 10 mm forward from the tragus and 2 mm below the tragus–lateral canthus line. In one joint, 0.6 ml PRP was injected and in other joint, 1 ml local anesthetic with 0.5 ml hydrocortison was injected using 27 gauge needle. During the procedure, the mouth of the patient should be wide open. After the injection, the patient is asked to do lateral and protrusive movements. Ice application was advised at site of injection for few minutes. TMJ sound was present only in two cases after 3 months in Group A, whereas in Group B, it was present in 5 patients [Figure 3]. There is higher number of absence in Group A than Group B thus better but not statistically significant P = 0.035. The TMJ is described as one of the most used joints in the body. The TMJ is a compound articulation formed from the articular surfaces of the temporal bone and the mandibular condyle. Both surfaces are covered by dense articular fibrocartilage. Each condyle articulates with a large surface area of temporal bone consisting of the articular fossa, articular eminence, and preglenoid plane. The TMJ functions uniquely in that the condyle both rotates within the fossa and translates anteriorly along the articular eminence. Because of the condyle's ability to translate, the mandible can have a much higher maximal incisal opening than would be possible with rotation alone. The joint is thus referred to as “gynglimodiarthrodial”: A combination of the terms ginglymoid (rotation) and arthroidial (translation). Anterior disc displacement with reduction refers to an unnatural forward movement of the disc during opening, which reduces on closing whereas anterior disc displacement without reduction refers to an unnatural forward movement of the disc during opening, which does not reduces on closing. The current conservative treatments suggested for TMD include patient behavioral education, resting the jaw, soft diet, analgesic agents, splints, and physiotherapy; surgical interventions include arthrocentesis, disc repositioning, or discectomy for patients with resistant internal derangement. 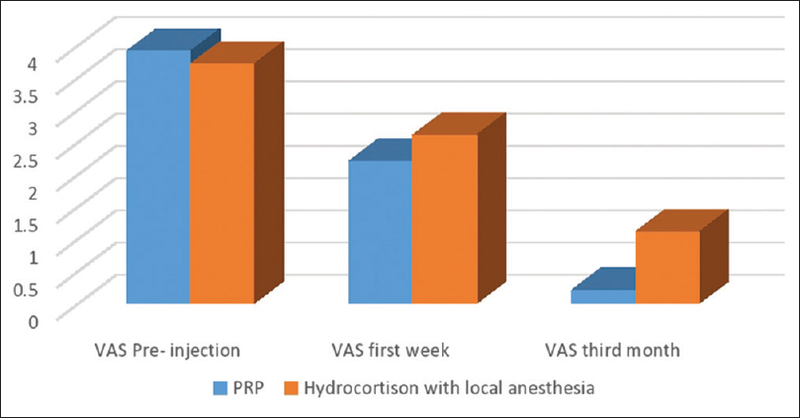 Here we assessed the efficacy of PRP injections compared to hydrocortisone with local anesthetic in the conservative management of anterior disc displacement with reduction. PRP is a concentrate of platelets and associated growth factors (GFs) obtained from a patient's blood. PRP has been clinically used for various applications, including periodontal, oral surgery,, maxillofacial surgery, esthetic plastic surgery,, spinal fusion,, heart by-pass surgery, and treatment of soft-tissue ulcers. The application of PRP amplifies the surge of chemical mediators to the microenvironment of the joint area, including platelet alpha granule-derived factors., The increased concentration of platelets and GFs simulates the initial stage of the inflammatory response, characterized by the migration of neutrophils, monocytes, and macrophages to the site of injury. Mediators and cytokines mediate the initiation of neovascularization, fibroblast proliferation, and further recruitment of inflammatory cells. In addition to the stimulatory effects on reparative cells, local PRP application may also have an inhibitory effect on specific pro inflammatory cytokines that may be detrimental to the early stages of healing, specifically through suppression of interleukin-1 release from activated macrophages. PRP increases chondrocyte proliferation and the production of matrix molecules and helped to maintain the integrity of the chondral surface and thereby facilitating joint movement. The analgesic effect of PRP has been highlighted in the literature which showed the augmentation of cannabinoid receptors CB1 and CB2, which might related to the analgesic effects of PRP. Emerging evidence has suggested that PRP might be of assistance in the treatment of degenerative conditions of the joints with reference to reduction in pain and joint sound. Corticosteroids are more potent anti-inflammatory agents and they act by entering the cell and bind with the glucocorticoid receptor. Steroid receptor complex enters into the nucleus and binds with Dna at specific sequence and Increase the anti-inflammatory gene expression. Corticosteroids also inhibit the prostaglandin synthesis which are mediators of inflammation. Intraarticular corticosteroids reported to have adverse effects in the knee joint, which include septic arthritis, post injection “flare,” local tissue atrophy, tendon rupture, cartilage damage, flushing, and increased blood glucose level. These adverse effects are relatively uncommon. To alleviate these disadvantages of corticosteroids we embarked on this study of intra-articular PRP in comparison to corticosteroid with long acting injections. Moreover, we found substantially good results with PRP. 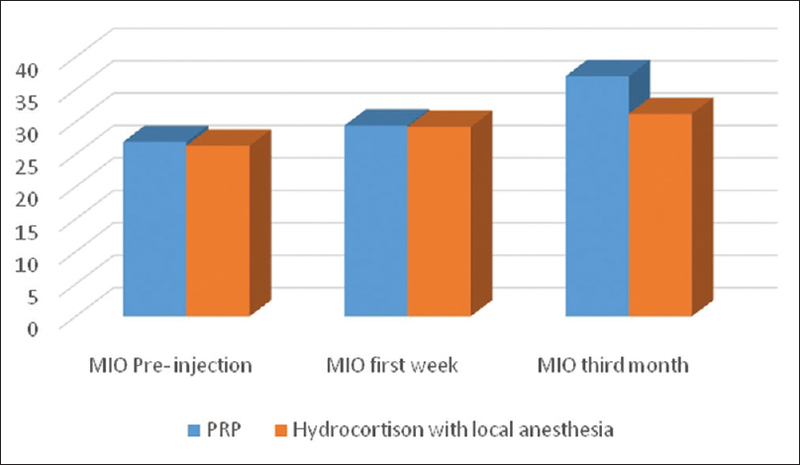 This study showed that local anesthetic with hydrocortisone and intra-articular PRP injection helps in pain reduction, increases mouth opening, and reduces joint sound when treating patients with anterior disc dislocation with reduction. It was also found that intra-articular PRP injection was more effective than local anesthetic with hydrocortisone in patients in this study. Although intra-articular PRP injection as a novel therapeutic approach may be a good alternative for the treatment of refractory TMD in the future, long-term studies are needed to explain the regenerative properties, cellular-molecular effects, and stem cell activation potential of PRP in the TMJ. Hanci M, Karamese M, Tosun Z, Aktan TM, Duman S, Savaci N. Intra-articular platelet-rich plasma injection for the treatment of temporomandibular disorders and a comparison with arthrocentesis. J Craniomaxillofac Surg 2015;43:162-6. Frank C, McDonald D, Shrive N. Collagen fi bril diameters in the rabbit medial collateral ligament scar: A longer term assessment. Connect Tissue Res 1997;36:261-9. Herb K, Cho S, Stiles MA. Temporomandibular joint pain and dysfunction. Curr Pain Headache Rep 2006;10:408-14. Leeuw R editor. Temporomandibular disorders. In: American Academy of Orofacial Pain Guidelines for Assessment, Diagnosis and Management. 4th ed. Chicago: Quintessence; 2008. Talley RL, Murphy GJ, Smith SD, Baylin MA, Haden JL. Standards for the history, examination, diagnosis, and treatment of temporomandibular disorders (TMD): A position paper. American Academy of Head, Neck and Facial Pain. Cranio 1990;8:60-77. Metzler P, von Wilmowsky C, Zimmermann R, Wiltfang J, Schlegel KA. The effect of current used bone substitution materials and platelet-rich plasma on periosteal cells by ectopic site implantation: An in-vivo pilot study. J Craniomaxillofac Surg 2012;40:409-15. Della Valle A, Sammartino G, Marenzi G, Tia M, Espedito di Lauro A, Ferrari F, et al. Prevention of postoperative bleeding in anticoagulated patients undergoing oral surgery: Use of platelet-rich plasma gel. J Oral Maxillofac Surg 2003;61:1275-8. Man D, Plosker H, Winland-Brown JE. The use of autologous platelet-rich plasma (platelet gel) and autologous platelet-poor plasma (fi brin glue) in cosmetic surgery. Plast Reconstr Surg 2001;107:229-37. Welsh WJ. Autologous platelet gel: Clinical function and usage in plastic surgery. Cosmet Dermatol 2000;11:13. Bose B, Balzarini MA. Bone graft gel: Autologous growth factors used with autograft bone for lumbar spine fusions. Adv Ther 2002; 19:170-5. Hee HT, Majd ME, Holt RT, Myers L. Do autologous growth factors enhance transforaminal lumbar interbody fusion? Eur Spine J 2003;12:400-7. Del Rossi AJ, Cernaianu AC, Vertrees RA, Wacker CJ, Fuller SJ, Cilley JH Jr., et al. Platelet-rich plasma reduces postoperative blood loss after cardiopulmonary bypass. J Thorac Cardiovasc Surg 1990;100:281-6. Margolis DJ, Kantor J, Santanna J, Strom BL, Berlin JA. Effectiveness of platelet releasate for the treatment of diabetic neuropathic foot ulcers. Diabetes Care 2001;24:483-8. Woodall J Jr, Tucci M, Mishra A, Asfour A, Benghuzzi H. Cellular effects of platelet rich plasmainterleukin1 release from PRP treated macrophages. Biomed Sci Instrum 2008;44:489-94. Pietrzak WS, Eppley BL. Platelet rich plasma: Biology and new technology. J Craniofac Surg 2005;16:1043-54. Filardo G, Kon E, Roffi A, Di Matteo B, Merli ML, Marcacci M. Platelet-rich plasma: Why intra-articular? A systematic review of preclinical studies and clinical evidence on PRP for joint degeneration. Knee Surg Sports Traumatol Arthrosc 2015;23:2459-74. Lee HR, Park KM, Joung YK, Park KD, Do SH. Platelet-rich plasma loaded hydrogel scaffold enhances chondrogenic differentiation and maturation with up-regulation of CB1 and CB2. J Control Release 2012;159:332-7. Hegab AF, Ali HE, Elmasry M, Khallaf MG. Platelet-rich plasma injection as an effective treatment for temporomandibular joint osteoarthritis. J Oral Maxillofac Surg 2015;73:1706-13. Samiee A, Sabzerou D, Edalatpajouh F, Clark GT, Ram S. Temporomandibular joint injection with corticosteroid and local anesthetic for limited mouth opening. J Oral Sci 2011;53:321-5.